The post Hozier talks new album ‘Wasteland, Baby!’ and the legacy of ‘Take Me To Church’ appeared first on NME. Hozier has discussed how his forthcoming album ‘Wasteland, Baby!‘ saw him working with soul icon Mavis Staples and the pressure involved in following up the success of runaway hit ‘Take Me To Church’. The Irish singer will release his second album on March 1, almost four and a half years after winning huge plaudits for his self-titled debut record. After he finished touring in 2016, he soon realised that the record would be influenced by the dark forces that were seemingly encircling the world at that time. “I came off the road in 2016 and I was just trying to reconnect after living on a bus. You’re in a bit of a bubble, so it was just nice for me to see what was going on,” he told NME. While the album might sound overly gloomy, the title track sees Hozier tackling how love can be found in the darkest of circumstances. The record also sees Hozier delivering one of his most soulful tracks to date on ‘Nina Cried Power’. The song featured on his 2018 EP of the same name and saw him collaborating with the legendary Mavis Staples. “She was a total hero. We crossed paths a few times on the last tour and there was talk of us working together. But when that song came about, it made sense to have her. It was a thank you note to artists who have imbued their work with that sense of protest,” he told NME. Describing how he flew to Chicago to work with Staples, he continued: “We spent the day together going over the song, we talked about the lyrics and then we recorded her parts there and then. And while ‘Take Me To Church’ may have catapulted Hozier to worldwide fame, he says he felt little pressure to follow it up with another monster hit. “The pressure was self-contained. My label and management were happy to give me all the time I needed, but the pressure was self-originating. It was more about writing music that still felt honest to me, in the way that I felt worthwhile when I wrote Church. I wanted to keep that going and stand proud of my work. I didn’t want it be a writers’ room, creating pop hits for the sake of pop hits,” he added. Wasteland, Baby! is released on March 1. 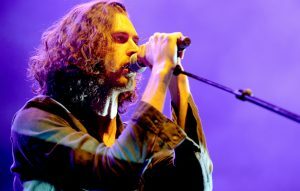 Hozier will play Cork’s Irish Independent Park on Tuesday June 25 and Belfast Ormeau Park on Thursday June 27, with more UK and European tour dates expected to be announced shortly.